Need more information about booking Home 4756730 ? Self Catering Traditional Crofters Cottage on Isle of Skye Weekly lets Saturday - Saturday Idyllically situated 8 miles south of Portree, the capitol of the island. Kirsty's cottage is the ideal location to get away from it all, but also an ideal location to explore the Isle of Skye.Kirsty's Cottage is a traditional Skye crofters cottage sympathetically renovated, offering spacious, luxury accommodation, sleeping 4 guests comfortably. 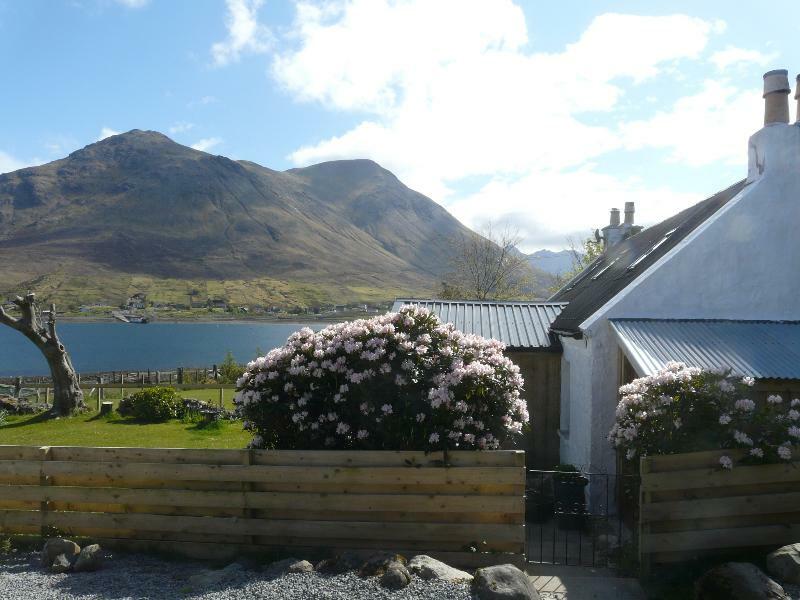 With stunning 180* panoramic views of Loch Sligachan, Glamaig and the Cuillins, and located by the seashore, just a 3 minute walk.The accommodation comprises of The Sun-room, ideal for relaxing, dining and enjoying panoramic views to the seashore where seals bask on the rocks. The sitting room has a wood burning stove and there is also underfloor heating through into the open plan well-appointed kitchen/diner.Double and Twin bedroom upstairs.There is a spacious, enclosed garden with patio areas - ideal for all the family. Car ideal for your holiday. Skye is mainly A roads although there are plenty of single track B roads with passing places to allow overtaking. Local tour guides offer a number of wildlife tours. Buses and taxis available in Portree. We usually meet on arrival to make sure you are settled in okay. As we are nearby we can be on hand during your stay, if you have any questions on places to visit, attractions,restaurants etc. We also supply lots of information in the cottage on places to visit too if you prefer the hands-off approach. Well behaved dogs only , not allowed upstairs or on furniture and a maximum of 2 by prior arrangement. All damage and breakages to be paid for .Please notify owners asap. see Kirsty's cottage website for terms and conditions. Number of guests must not exceed 5. This Cottage has 2 bedrooms, 1 bathroom and sleeps 4. It’s been listed on Holiday Lettings since 08 Aug 2014. Located in Portree, it has 65 reviews with an overall rating of 5. The average weekly rate varies from £670 to £899. Best cottage we have ever stayed in definitely home from home all the amenities you could ever want we were never out of the sun room a nice extra would be a portable T.V. In the sun room to watch at night would be the icing on the cake ,outstanding views and places to visit one week wasn't enough we will be back next year all being well. We spent a week in Kirsty Cottage, it is home from home, has everything you need and more, very comfortable, the views are wonderful, spent a lot of time watching the seals witch we all enjoyed, there are small ponies too when you walk to the beach. Dawn and Andrew were very helpful, but not intrusive. we traveled all over Skye from the cottage, it is quiet however easy to access the Island. We also got some great news when we were there, we are going to be Grandparents again. Thank you for a lovely holiday. Beautiful location. Accommodation very comfortable and homely and lacks for nothing. Everything is tastefully done. Would highly recommend. Just beware of potholes on the island! Our family (2 adults and a two year's old toddler) stayed at the Kristy's Cottage for five days in September 2016. We are pleased with our decision for it's location, fabulous view and the personal touch of the property. Unlike other holiday rental house, this property has the warmth feeling of home (it's the home of Dawn and Andrew in winter) and we love it. We chose to stay here for our little boy's second birthday for a lovely memory. Highly recommend to all families. What a lovely cottage, a real home from home that had everything we needed and more. It is set in a lovely location out from Portree with lovely views but still very central for touring the island. We had a lovely week both visiting all the main tourist attractions and going exploring to the quieter places. Kirsty's cottage made a lovely cosy place to come back to, it has a lovely sun room which we ate our dinner enjoying the stunning views. Owner's reply: Thanks for your great view glad your enjoyed your visit to Skye and your stay with us. It is nice also to go off the beaten track! Our visit started with a 3 hour drive in a rental car from Inverness Airport. The time flew by as the scenery became more and more breath taking. The cottage sits about 100 yards from the mouth of a loch, and can be seen from the opposite shore on your drive in (at least 30 minutes before you arrive on day one). On arrival, we were so relieved to find that the cottage felt like a home from home. There were none of the damp corners, bad smells and tired nick nacks that we had come to expect from previous self catering experiences. The beds were comfortable, the kitchen ideal, and the underfloor heating a real treat for cold days. Also, the TV and DVD collection were an ideal way for our teenage family to relax in the evening after a long day out adventuring. Our children loved watching the seals as they porpoised in the loch below, and the sheep as they grazed on the hill behind the cottage. Our favourite places to visit from the cottage were the Coral Beach, The Fairy Pools, and an evening drive along the B885 road from Bracadale to Portree - the most beautiful moorland drive of our lives! For the adventurous, the hills behind the cottage offer great views and the chance for a cardiovascular workout, as well as discovering hidden pools and waterfalls. We would not think twice about coming again or recommending this wonderful place to friends! This is a great place to stay, and although we have stayed in quite a few holiday lets over the years, and often said 'we must go back', this time we mean it ! The accommodation is really comfortable and welcoming, and the views are amazing. Dawn and Andrew were very helpful, and it was a pleasure to meet them both. The location is great it you want a bit of peace and quiet and the birds and seals seem to agree. The cottage is clean, well equipped and well set out, and is obviously very well loved. The wood burning stove was a bit of a treat for us and we got a decent fire going on each night of our stay. Skye itself is the most beautiful place to visit and the walks and scenery are breathtaking. There were a couple of household faults during our stay (that will be dealt with I'm sure), but nothing that spoilt our enjoyment of a memorable holiday. This was just the cottage for four people in Skye for a week's walking. We had a friendly welcome from Dawn and thereafter had all we needed indoors and outdoors. We shall particularly remember our local walks - around the An Aird peninsula, along Loch Sligachan, up Ben Tianavaig and, via the CalMac ferry, on the island of Raasay. Further afield we particularly enjoyed the Glamaig Round, The Old Man of Storr, the Talsiker distillery, Glen Brittle and the boat trip from Elgol to Loch Coruisk. Our dog also enjoyed the week despite having to spend much of it on a lead as there were sheep everywhere. The cottage itself is stylish, practical, warm(underfloor heating) and very well equipped. It is also very well located both for walking and access to Portree. We have stayed in many cottages and this has to be one of the best. We were very sorry when our week came to an end. You can get in touch with Dawn & Andrew (the owner) through the contact form on this page. Send Dawn & Andrew (the owner) an email through the contact form on this page. Alternatively, if there’s a phone number on this page, you can call them. How do I contact Dawn & Andrew (the owner)? If you’ve already booked, go to Manage your holiday booking to view Dawn & Andrew the owner's contact details or send them a message. Or send Dawn & Andrew (the owner) an enquiry through the Contact the owner/manager form if you’d like a quote or more info first. When you pay online through the Book your stay form, a booking request is sent to Dawn & Andrew (the owner). You’ll find out within 24 hours whether they’ve accepted - no money will leave your account before then. You can also request a quote from Dawn & Andrew (the owner) through the contact form. The owner will email you the total cost for your dates and a link to book and pay online. Use the Book your stay form to pay provisionally online. You can pay by credit/debit card or PayPal. Dawn & Andrew (the owner) will have 24 hours to accept the booking and no money will leave your account before then. Why can't I call Dawn & Andrew (the owner) before booking? You’ll need to contact Dawn & Andrew (the owner) to do this. Send them a message in Manage your holiday booking or through the contact form on this page. You can request to change the dates or number of people on your booking via the Manage your holiday booking page. To change your holiday dates use the Edit booking button. If you need to change the number of guests staying then send Dawn & Andrew (the owner) a message. If Dawn & Andrew (the owner) agrees, they’ll send you a revised quote outlining the changes. You can review and accept/decline this from the Manage your holiday booking page. You’ll have 48 hours to take action before the revised quote expires.